For any of you who have been following my blog for any length of time, you'll know that I have a "thing" about houses-- especially old houses. They speak to me. The first time I realized I had this fascination was during a road trip my mother and I took through the South the summer when I was ten. My mother loved plantation houses, and our route through Tennessee, Mississippi and Alabama had several stops during which we toured those old homes. I loved it, and each one of those houses had a different feel to me. Some were contented and pleased with themselves; some felt tired; and some were downright sad. 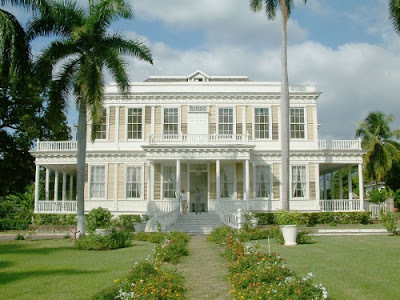 Unlike my mother, my interest in old homes extended well past those plantation houses. It doesn't really matter what example of architecture a house may be, if it speaks to me, I want to wander around-- both inside and out-- and soak up the ambiance. This feeling about old houses was something I accepted; it was just part of me, and I didn't think about it very much until I attended the author signing for Donis Casey and Vicki Delany at the Poisoned Pen last month. Vicki began speaking about Gothic novels, about how they almost always involved an old house with some sort of secret. When she said that, my mind was off to the races. I wasn't officially a teenager yet when I began devouring the Gothic novels of writers like Victoria Holt, Daphne du Maurier, Norah Lofts, Phyllis Whitney, Barbara Michaels, and Dorothy Eden. Although I can't say that I ignored the romantic elements in all their novels, I was more intent on the settings... and all those marvelous old castles and houses. Yum! While my mind was happily trotting down Memory Lane, I had another thought: would this make a good topic for a blog post? And this is how Five Favorite Fictional Houses came to be. When I got home from the author signing, I sat down and wrote down the first five fictional houses that came to mind. (Well, one of them is real, but let's not get too picky, okay?) These are the houses that came to mind. Hopefully some of them are your own favorites, too, but even more importantly, I'm hoping that you'll share some of yours with me! The morning after the battle, the bodies of four Confederate generals killed during the fighting lay on Carnton's back porch. The floors of the restored home are still stained with the blood of the men who were treated there. 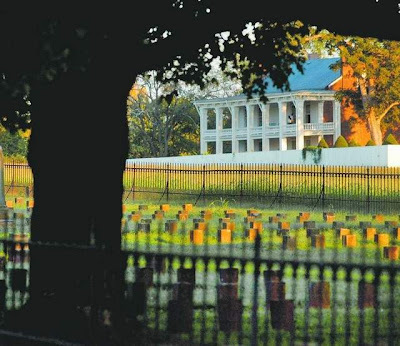 In early 1866, owners John and Carrie McGavock designated two acres of land adjacent to their family cemetery as a final burial place for nearly 1,500 Confederate soldiers killed during the Battle of Franklin. Carrie McGavock worked tirelessly for the rest of her life to identify and bury every soldier she could. When a body was identified, she tried her best to notify next of kin so the families would have some sense of closure. This formed the basis for Hicks' novel, The Widow of the South. This book holds special meaning to me because my great-great-great grandfather, James Henry Brown, was killed in the Battle of Franklin. Confederate blood... Yankee blood... blood is blood. Pain is pain. Horror is horror. All can be vanquished by the kind and compassionate heart of one woman. Just think what Carnton could tell us if only it could speak! All Coulibri Estate had gone wild like the garden, gone to bush. No more slavery-- why should anybody work? This never saddened me. I did not remember the place when it was prosperous. Coulibri... picture of lush beauty and rot. A glimpse into what Antoinette Cosway was to become. I can still walk the verandahs of Coulibri, still see the green light and smell the overpowering scent of flowers, and it's probably been twenty years since I've read Wide Sargasso Sea in its entirety. Rhys could weave a spell! North Lees Hall, Yorkshire. 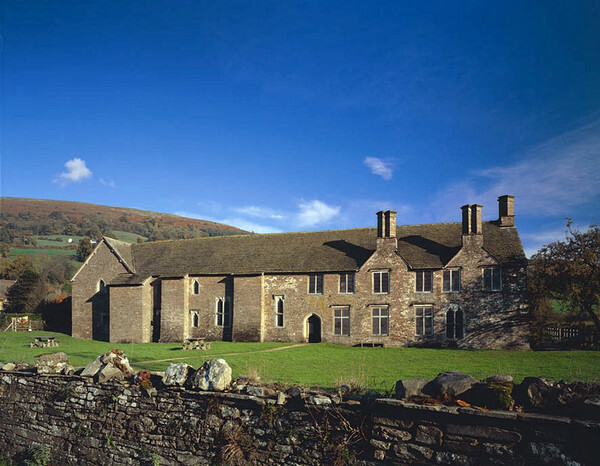 Brontë's inspiration for Thornfield Hall. 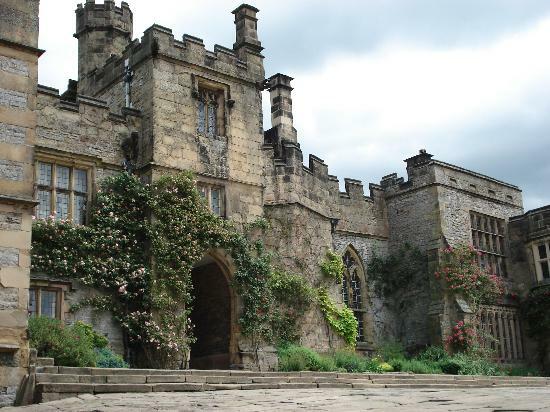 Haddon Hall, Derbyshire. 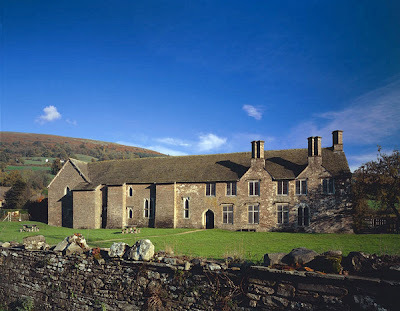 Filmland's version of Thornfield Hall. 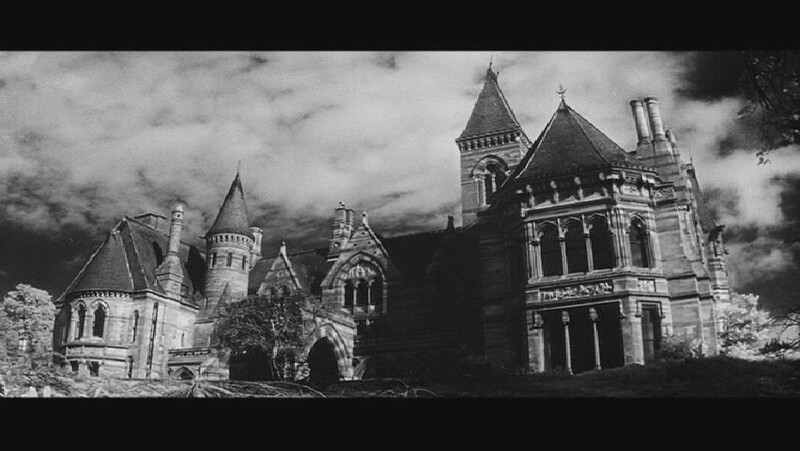 ...I looked up and surveyed the front of the mansion. It was three stories high, of proportions not vast, though considerable: a gentleman's manor-house, not a nobleman's seat: battlements round the top gave it a picturesque look. Its grey front stood out well from the background of a rookery, whose cawing tenants were now on the wing: they flew over the lawn and grounds to alight in a great meadow, from which these were separated by a sunk fence, and where an array of mighty old thorn trees, strong, knotty, and broad as oaks, at once explained the etymology of the mansion's designation. And when Rochester's mad wife set it ablaze, I still can see the flames shooting out of the windows, watch Bertha plummet from the battlements to the ground. Brontë's novel needed the strong setting of Thornfield for it to come to life. It was mainly a wooden building, with a great pointed gable facing eastwards and covered balconies at first floor level that gave access to the upstairs rooms. Behind it, and on either side, stretched other buildings that had been built on at various times, so that there was a motley collection of roofs, gables and structures to be seen on all sides. And the whole messy collection made up Micklelith House, the name being carved into the stone lintel over the main door. It looked what it was, in fact-- a large, extended farmhouse. With each succeeding book in the series (there are now thirty-four), I fell more and more in love with the Morland family-- and with its house. Harrod-Eagles includes floorplans of the house in several of the books because each generation changes it in some way: adding rooms and wings in the fashionable styles of the times, and tearing down other bits that don't please them. And of course there are the generations that fall upon hard times, so the house languishes, too. So much life, so many secrets, flourish in that house over the centuries that I-- quite simply-- love it. Without doubt that is one of the best beginnings to any book I have ever read. "Hill House, not sane..." Years ago when I first read this book, that one phrase brought the first chill to my spine. From the beginning Jackson implied that a house can have intelligence, a house can have a spirit-- and I've been hooked ever since. As you can see from my list, I love houses with age, houses that have lived with their families for a long time, houses that have history, secrets... and sometimes minds of their own. Now it's your turn. Did I list any of your own favorite fictional houses? Which ones? More importantly-- which ones did I leave out??? An interesting post, great houses and every one with a delightful story. Manderley and Misselthwaite would definitely be on my extended list! I very much agree with you about Hill House. I'd only add Stephen King's Overlook Hotel and Richard Matheson's Hell House. I guess I have a thing for haunted houses ;-). Oh... I'd forgotten all about Hell House. Shame on me! I love that you have Hill House at the top of the list. You've brought up some excellent choices, too. Thanks! I am definitely adding The Haunting of Hill House to my TBR and then will watch the film! Great list! I'm glad you enjoyed it, Melissa! I like your choices, Cathy. I must remember to add THE HAUNTING OF HILL HOUSE to my library list. I keep meaning to. Brideshead from the book by Evelyn Waugh: BRIDESHEAD REVISITED. The house is almost another character in the story. Excellent choice to add to the list, Yvette!